Manufacturer & Supplier of RCC Grass Paver. Our product range also comprises of Precast Compound Wall, RCC Road Divider and SFRC Manhole Covers. Owing to rich industry experience, we offer RCC Grass Paver to our clients. Our products are widely demanded amongst for their high quality and optimum strength. Using high grade materials and tools, we manufacture the product in the best possible method so as to offer the best quality product to our RCC Grass Paverclients. Our clients can avail the product in the most affordable price range to meet their requirements. 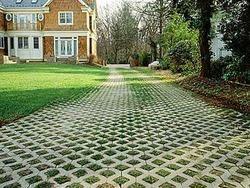 Looking for RCC Grass Paver ?